Today, we announced that Microsoft Connections, Microsoft Listings, Microsoft Invoicing, and the Office 365 Business center are now generally available as part of Microsoft 365 Business and Office 365 Business Premium. The new apps are rolling out to customers in the U.S., U.K., and Canada. These apps—together with Microsoft Bookings, Outlook Customer Manager, and MileIQ—bring you seven new ways to manage your customer relationships and build your business. We’re also announcing new intelligence features for MileIQ that automatically classify drives as business or personal on your behalf. Let’s take a closer look at how the apps can help you grow your business by acquiring new customers and nurturing existing ones, and help you run your business with simple ways to invoice, schedule appointments, and track mileage—all from one location. Nurture customer relationships, create email marketing campaigns, and help new customers discover you more easily with Microsoft Listings, Microsoft Connections, and Outlook Customer Manager. 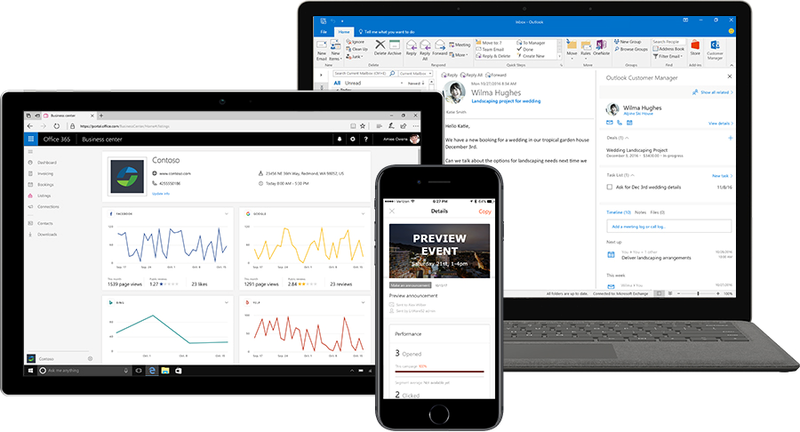 Microsoft Listings, Microsoft Connections, and Outlook Customer Manager help you connect with customers to grow your business. Microsoft Listings—Bring in new customers by getting your business listed on Facebook, Google, Bing, and Yelp from one place. Ensure your business information and brand—including name, address, phone number, website, hours, and logo—are consistent across these sites. Also, easily monitor views and reviews of your business in one view. Microsoft Connections—Send professional-looking marketing emails that showcase your brand and drive sales. Engage current customers with newsletters and announcements that remind them to make a visit. Easily set up incentives like refer-a-friend discounts to reward current customers for referrals so you can bring more business through the door. Outlook Customer Manager—Grow your relationships with a simple, smart customer management solution. Get quick access to all customer information—emails, meetings, calls, notes, tasks, deals, reminders, and deadlines—right next to your inbox so you spend less time managing data and navigating multiple screens and more time growing customer relationships. 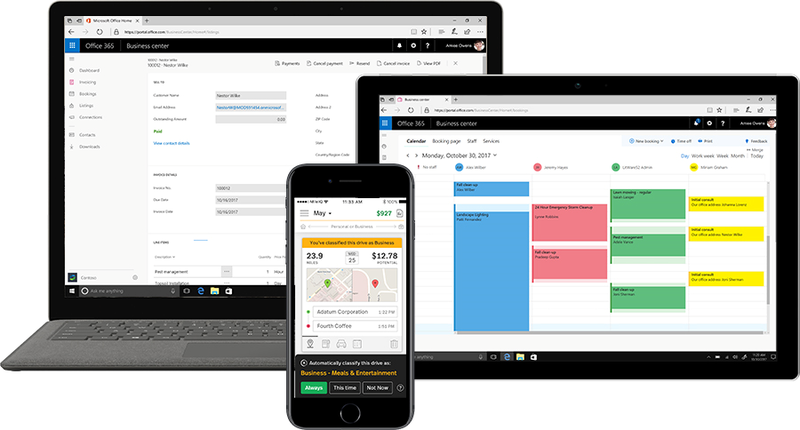 Send invoices and estimates, manage customer appointments, and track your mileage with Microsoft Invoicing, Bookings, and MileIQ. Microsoft Invoicing, Bookings, and MileIQ help you run your business more efficiently. Microsoft Invoicing—Generate estimates and invoices that look professional. Get paid fast with online payments, track pending and partial payments, find draft estimates and past invoices, set sales tax and discounts, and quickly transform estimates into invoices—all in a few clicks. Bookings—Easily manage your customers’ appointments. Enable your customers to choose the time slot they want through a simple-to-set-up booking webpage with built-in Facebook integration. Bookings also automatically adds appointments to your staff’s calendars that are updated automatically upon rescheduling or canceling. MileIQ—Track your miles in a simpler, smarter way with automatic drive detection, mileage logging, and comprehensive reporting. Classify the trip as business or personal in one swipe. We also added new intelligence features that save you valuable time by automatically classifying trips as business or personal based on your work hours and drives you frequently take. 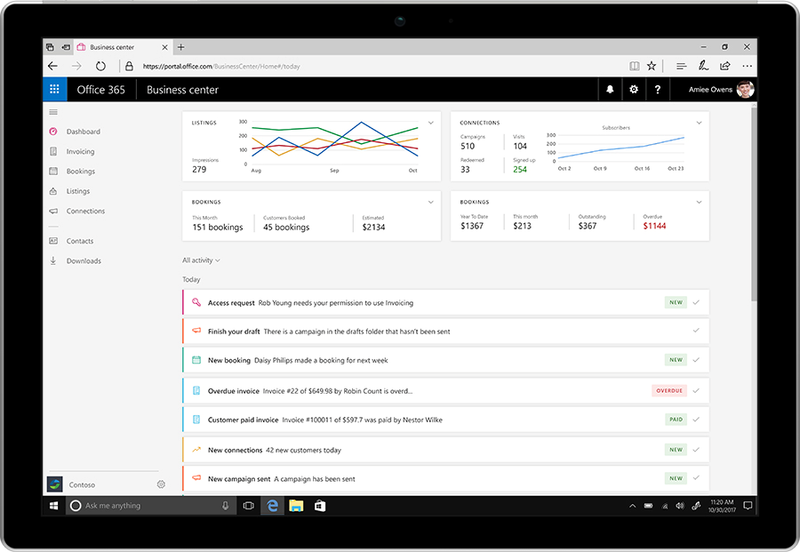 The Business center serves as a central access point and dashboard for the apps, bringing together the tools that help you provide excellent service to your current and potential customers—including Microsoft Connections, Microsoft Listings, Microsoft Invoicing, and Bookings. You can track key business metrics like total and outstanding invoices, email subscribers, online impressions, and total bookings to pinpoint what’s working and what’s not, so you can get the most out of your time. The Business center helps you stay on top of activities across the business apps to save you time. 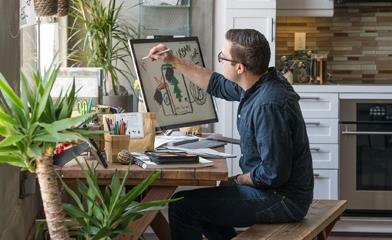 Because these business apps are part of Office 365, getting started is as easy as clicking a button in Outlook or exploring a new tile from your Office.com home page. There’s no need to manage multiple sign-ins or transfer data between different tools—your Office 365 sign-in gives you access across the apps. The apps use data already present in Office 365, such as email data and calendar free/busy information, to power a simple and integrated experience. Best of all, the business apps are included at no additional cost in Microsoft 365 Business and Office 365 Business Premium subscriptions. You may already have seen the Business center show up in your Office.com home page—this means that the apps are ready for you to use. If not, expect to get access in the next few weeks. If you are eager to get started, you can join First Release, which will get you fastest access to the apps, and also give you early access to new features as we add them in the coming months. Not a current subscriber? Just purchase or start a trial of Microsoft 365 Business or Office 365 Business Premium and start using all the business apps. Microsoft Connections, Microsoft Listings, Microsoft Invoicing, Business center, and MileIQ are currently available in the U.S., U.K., and Canada. Bookings and Outlook Customer Manager are available worldwide. We’re eager for you to start using these tools, and we’re confident they will help you bring in new customers and more easily manage your business, so you can do more of the work you love. Q. When will Microsoft Connections, Microsoft Listings, Microsoft Invoicing, MileIQ, and the Business center be available in additional countries? A. We are working to expand our offering to other countries and regions and will share timelines as we get closer to those dates. A. Yes, the Office 365 global admin role controls who has access to these apps, except for MileIQ. By default, standard users have access to Bookings and Outlook Customer Manager, but not Microsoft Connections, Microsoft Listings, and Microsoft Invoicing. They can request access directly from the Business center. Global admins can accept or decline their request from Admin center > Settings > Services & add-ins > Business center. Q. Will additional Office 365 subscription plans such as E3 and E5 include business apps? A. We know that many small businesses subscribe to E3 and E5 plans for advanced capabilities and are working to bring the apps to these plans. Q. How do I activate the MileIQ benefit of my Office 365 Business Premium or Microsoft 365 Business subscription? A. Visit www.mileiq.com/office365 to create a new MileIQ account or sign in using your existing one, and then enter your Office 365 credentials so we can activate your subscription benefit.